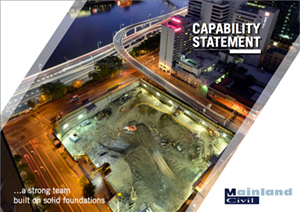 Mainland Civil have completed 99% of the piling and bulk earthworks for the Charles Perkins Centre Project. At all times they have managed a productive and safe site and have been responsive to the many complications that have evolved during the project. Project was highly complex in nature and was affected by significant period of inclement weather and prolonged archaeological investigations, Mainland Civil assisted with the process of mitigating the impacts of these delays in a co-operative manner. Overall product quality was of a high standard and the site was always well supervised and maintained in an orderly manner. Despite the challenges of addressing the co-ordination of the temporary shoring with the existing adjacent services and meeting the specific requirements of Sydney Metro in regard to the proposed tunnels to be constructed directly under the site, Mainland Civil undertook the works with a positive and professional approach. We have no hesitation in engaging Mainland Civil as they always deliver without dispute. Mainland worked to a high standard of quality and timely delivery whilst maintaining open communications. Mainland’s combination of project personnel, price and programme provided them with the competitive advantage to secure this contract. Throughout the performance of the works, Mainland Civil showed dedication to the performance and quality of the works and worked cooperatively with both Fielder Engineers and designers and project managers. The constructed product has met or exceeded the specified requirement and at all times through the delivery of the project Mainland Civil have met their responsibilities and commitments without reservation.